This is the twenty-fourth in this series of 26 posts, one for each letter of the alphabet, that I am writing during the Blogging from A to Z Challenge, April 2016. You can find all the posts, as they are published throughout the month, by following the A-to-Z April 2016 tag. X is for X Chromosomes. The art of Wing Chun was (according to their accepted legends) created by a Shaolin Buddhist Nun, Ng Mui, as a form of self defense that didn’t rely on size or strength. The art was named after her first student, Yim Wing Chun. United States history also includes female warriors. In many cases women had to pass as men to be allowed to train and fight for their country. According to this Library of Congress blog post, “… at least 400 women served as soldiers on both sides of the Civil War …” From the same source, “The stories of these women soldiers seemed to be collectively dismissed and disbelieved, pushed to the margins and regulated to footnotes if not forgotten entirely.” I’m sure this is not unique to the civil war period, and helps account for our general ignorance of women’s involvement in martial pursuits. Aikido also has a strong female influence. You may recall that in our earlier discussion of history, we learned that O Sensei, the founder of Aikido, was strongly influenced in his spiritual and philosophical beliefs by the Omoto religion. Omoto-kyo was founded by a woman, Nau Deguchi. Onisaburo Deguchi, O-Sensei’s spiritual teacher, was her son-in-law. In martial arts, as in other areas, most of the organizations overseeing administration, including rank promotion, have been managed by men. As in almost every other area of life, women are often seen as being less capable, less committed, and less worthy of recognition – also-rans, playing along for their own amusement, not serious students or practitioners. There are many cases of women not being granted high rank or public recognition alongside their male peers. Even Fukuda Keiko Shihan, the only woman to ultimately achieve 10th Dan in Judo, faced a long battle against this bias. According to the Keiko Fukuda Judo Foundation, “She gave up mar­riage and left her home­land to ded­i­cate her life to judo, fight­ing gen­der dis­crim­i­na­tion that kept her at lower belt lev­els decades longer than men less skilled than she.” Here is an 11-minute excerpt from the documentary about Fukuda Shihan, the highest ranking woman (10th dan) in Judo: “Be Strong, Be Gentle, Be Beautiful.” In the film the head of the Judo organization is reported to have said that Fukuda would not be awarded 9th dan (a very high rank) because no other women had been awarded 9th dan – a kind of circular reasoning that would result in no woman ever being granted that rank, regardless of achievement or contribution to the art. Some women have been discouraged even at the lower levels, or treated as if they and their training really didn’t matter. I encountered this myself, decades ago, as a 3rd grader, in Judo. The boys, many of whom were more experienced students, refused to train with me, my sister, and our friend – and the teacher allowed that. Naturally we learned very little, and didn’t continue after the summer program ended. I don’t know any woman who takes up training in a martial art in the hopes of learning a special, watered-down version “for girls.” Women want to be challenged, pushed to become their absolute best. If you find you have a teacher who doesn’t consider you to be a student as serious as any man in the dojo, and an honest conversation doesn’t resolve the situation, leave. You cannot be their student if they are not able to be your teacher. In Tuesday’s first class, as sometimes happens, there were more women on the mat than men. In the second class the participants were all male, but the instructor was female – me. During open training session after one recent class I noticed that all seven students on the mat were women, working on upcoming exams. Our dojo is pretty well balanced that way, right up through the ranks. At least 7 of our black belts, or yudansha [you-DAHN-shah], some of whom are also instructors, are women: Megan, Karen, Sharon, Amy, Stephanie, Cathe, and myself. 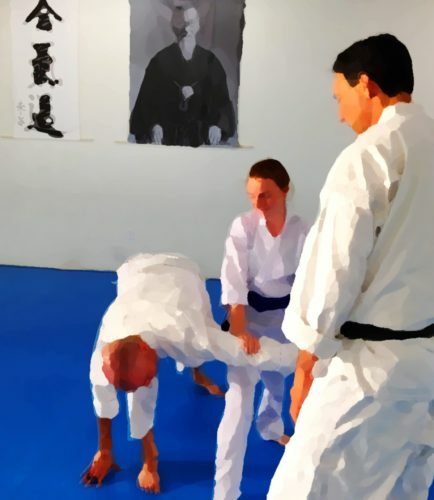 Locally, in San Diego County, I am aware of at least 5 major Aikido dojo that are lead by women – and this is out of about 8-10, so a very balanced ratio. Many schools throughout California are also lead by women, and a woman, Pat Hendricks Shihan, 7th dan, heads one of the three divisions of the California Aikido Association. In a televised interview I heard years ago, in response to a question about what it was like to be a woman in a man’s world (the music industry). Aikido is a popular martial art among women. Many senior teachers are women. Because Aikido relies on subtlety and finesse, not size or brute strength, it is ideal for women, smaller men, and even children. Aikido’s philosophy of dealing with conflict without fighting is appealing, and the culture of Aikido is an inclusive and welcoming one. As a woman in Aikido I have not experienced any sense of the art being “a men’s club,” nor its equally abhorrent opposite “how nice that women can do Aikido, too,” as if we were encroaching on the domain of men. The only minor thing I’ve noticed is that some men can be shy about executing powerful or close-contact techniques. A few have been cautious, even apologetic, about throwing me. I’m sure there is a deeply-ingrained “we don’t hit girls” ethic at work. It may also be our ages – with some I’m old enough to be their mother. Usually throwing them powerfully a few times (appropriate to their level, of course) is enough to put their minds at ease about that. On a few occasions I have been the only woman in a class. I usually don’t even notice until I go to change afterward and find that everyone else has gone into the other changing room. That’s a strangely lonely feeling. On the rare occasions when there’s only been one man in class I’ve felt bad for him, while we’re getting changed and talking and laughing together after class, that he’s suddenly aware of being different, and feeling excluded over there across the lobby, alone in his own changing room. Been there. If I ever have the opportunity to design a dojo facility I have an idea in mind – changing rooms with an opaque divider between them, but one that allows for conversation to continue. Even as balanced as the art can be, we have had women come to our seminars and say, with happy relief, that it’s so nice to have other women to train with – that they are the only one at their dojo. There’s certainly room for improvement. Sometimes the presence of women in a dojo, or our absence, feeds on itself. If a prospective new student comes to observe a class and sees lots of women training, she might feel more comfortable giving Aikido a try. For schools with few (or no) women, if can be challenging to build a more balanced membership. If you are that prospective new student, I urge you to jump in anyway! You could be the role model who encourages the next woman to join. These are an issue in the fitness industry, too. Some people think they are necessary because women don’t get fair treatment in a coed environment. I am of two minds on this issue. First, I dislike the idea of a gender-exclusive class or seminar. I don’t like the justification that “it’s just us gals/guys, so we can relax and feel comfortable with each other.” If Aikido is an inclusive community, then how can we have training that excludes men? On the other hand, some women are uncomfortable about the idea of training with men. Some may have experienced past trauma at the hands of men, and may be truly too afraid to get physical with male fellow students. Does it contribute to the overall good to support these women in training by offering women-only classes? Or is it better to let them stay away until they are ready to train as part of the greater dojo community? Here I can see plausible reason to offer a special class (and maybe one for men, too, as they can have issues as well), but only with the goal of getting the students to the point where they can join the regular classes as quickly as possible. Ultimately, the point is for everyone (gender, race, nationality, etc. ), to train together harmoniously. A few years ago a friend passed along an announcement by a respected, high-ranking Aikido sensei who had an opening at his dojo for an uchi-deshi, or live-in student. This is a valuable opportunity to take on an apprentice-like position, practicing the art and learning from a master day in and day out. These openings are rare. The post said that because there was “heavy work” involved around the facility (specifically lifting up to 50 pounds), only men would be considered. My immediate, gut-level reply was a two word phrase that can’t be repeated in this family-friendly series. He presumably has something worth offering to students, but with this limitation on participation, only men will be able to benefit from his teaching. I went back and deleted my comment out of a probably misguided desire to appear respectful, but I have little respect for that teacher. I learned later that apparently his wife insisted on the males-only rule. Whether because of actual past behavior or just jealousy, I don’t know. It is understandable that it could be awkward having a female student living at a dojo run by a man – or vice versa. But if developing a warrior spirit means bravely facing fear, pain, and even death, then certainly one should have the courage to handle an awkward situation with fairness and integrity. It’s an unfortunate situation in our culture that we have to be paranoid about appearances. This is true in the fitness world as well. Being careful never to be alone with a student of the opposite gender. We can be jumpy about the potential for false accusations and rumors. What this means in a practical sense is that in some cases men will have opportunities that women will not – or the converse, when the sensei is a women. If the only way you can have such a program is to exclude half of the potential participants for reasons that have nothing to do with their dedication, ability, or potential, then don’t have the program. This is one glaring example, but there are many smaller ones. I have heard of cases where a group of men, sometimes including the instructor, will head off to the local pub after class without even thinking of including the women they were just training with. A few years ago we had a dojo ladies’ outing. It was a nice event, but I felt bad about leaving the guys behind. Lesson learned. As with executive golf outings and similar informal gatherings, these things are often where the good stories get told, friendships and mentorships develop, insider information is exchanged, and connections are made with people of power and influence. When women (or men) are excluded, either deliberately or though simple “oh, I didn’t think you’d be interested” kind of thoughtlessness, it limits their potential, and diminishes everyone’s sense of community. George Ledyard Sensei, who has been a strong influence in my training, and good friend, has observed that students of each gender respond differently when we run up against our limits on the mat. Men turn into jerks, getting forceful and mean. Women go into the changing room and cry. I despise the idea of gender stereotypes, but I think this one is true, at least in my own experience. While it is important that people of any gender are afforded the same opportunities for training, development, and recognition, it’s important to note that there are differences. Whether they are cultural or biological is beyond the scope of this post. The trends and tendencies overlap – some women will be more masculine (I tend toward the tomboy end of the range), and some men more feminine – and there are outliers, of course. But we do have our temperamental and behavioral differences. I see it among adults, and also in the children’s classes, even among the youngest kids. Someday I plan to write a paper (or short book) discussing some points about supporting women and girls in training in the martial arts, including physical, biological, cultural, and emotional issues. That should be an interesting, and possibly controversial, subject. Some schools (in Aikido and other arts) find it challenging to attract and retain female students, and my goal will be to provide practical pointers they can use to make their schools more appealing and welcoming to women and girls. One of the greatest benefits I see in Aikido training is becoming more functional and comfortable along a broader span of the masculine/feminine continuum. Regardless of biological gender, people with strong masculine energy can develop their softness and receptivity. People with strong feminine energy can develop their power and assertiveness. When we have access to a wider range of responses – not just the limited set we’ve come to favor – we can freely choose the most appropriate one in a given situation.